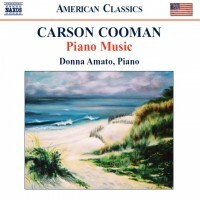 Fourth Piano Sonata (2005) was commissioned by and is dedicated to pianist Donna Amato, whose commitment and devotion to my music has been a continuing inspiration. The work is in three movements, each using the exact same musical material. Each movement presents a trajectory towards a greater integration of the disparate pieces of this material. The first movement, Mourning at Sunset, presents the basic ideas in clearly defined blocks. An opening section of forceful, declamatory chords alternates with a more lyrical section of interlocking lines. The forceful music returns before a slow, desolate section is presented. This builds to a small climax before dying down again. The opening then returns. The second movement, Beyond Distant Echoes, is slow and ethereal. Sounds of distant gongs alternate with brittle, spasmodic interjections. The third movement, Whispers of Mortality, is inspired by the finale of Frederic Chopin’s Piano Sonata No. 2 in B-flat minor,op. 35 (1839). It is fast, fleeting, and “too short.” The musical material has transformed into pure running roulades of raw notes. Unlike the Chopin, however, the passagework is cast in a series of interlocking canonic structures of fiendish difficulty. The movement evaporates into the uppermost register.